Add more creativity to your lightshow with the American DJ FREQ 16 revolutionary 16-Zone LED Strobe. This 2-FX-IN-1fixture features a traditional LED strobe + 16-Zone chase effect. The Zone chase effect gives lighting designers the ability to display this strobe bar vertical or horizontal creating chasing white light for a dynamic energy-driven light show. The FREQ 16 offers full DMX control with 4 DMX channel modes, dimming, strobe speed and chase speed. Users can also run the FREQ 16 in sound active mode, or manually control strobe speed and dimming on the back of the unit from it’s potentiometer knobs. The FREQ 16 uses sixteen 5-Watt bright white LEDs and consumes a maximum of 91-Watts of power. 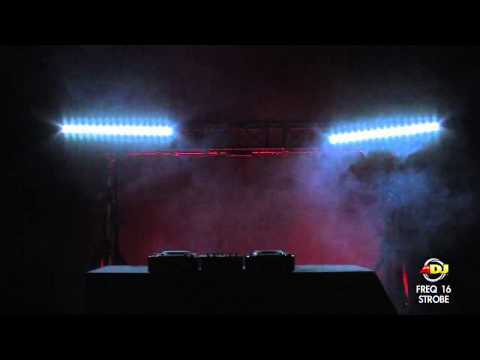 Considering purchasing the American DJ FREQ 16 LED Strobe Bar? Have questions? Ask people who've recently bought one. Do you own the American DJ FREQ 16 LED Strobe Bar? Why not write a review based on your experience with it. An amazing piece of kit, I purchased the ADJ UC3 controller that plugs into the back of the strobe light meaning I can control it at the dj box whilst it's installed high into the gods. It needs to be high as it is so powerful for a small - medium sized clubs. Powerful enough for a room capacity size of 500+ easy. The different modes and strobe types are really good and if your club room is small, you can always dim the brightness of the strobe! 10/10! Wow.....what a great little fixture. It is brighter than it looks!!! There are so many things you can do with just a strobe light. It makes every setup look fab and pro at the same time. This is so bright!! Well done ADJ !!!! If you compare this to its smaller sibling this has such an amazing amount of brightness! Although we use 3 in the venue you could easily get away with just the one and it would be enough! 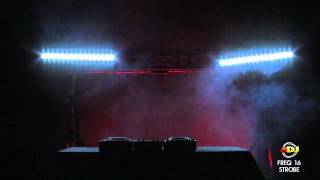 Seen a video for American DJ FREQ 16 LED Strobe Bar online or have you own video? Check out American DJ FREQ 16 LED Strobe Bar on DJkit.com!